She usually tries “Out” first. I can’t say as I blame her. LOL. Posted on July 19, 2013 July 19, 2013 Categories A Dog's LifeTags dog's life2 Comments on Do SOMEthing, Mom! The winner of the Academy Award for Best Feline Dramatic Performance is none other than our own Pumpkin the Cat. Weighing in at a hefty fourteen pounds, Pumpkin has managed to communicate that she is a poor, starving stray who deserves more food. My mom falls for it. “Maybe just a few crunchies,” she says. As for me, I get my food carefully measured at each of my two daily meals. My mom is terrified that I’ll get fat and put too much pressure on my slender leg joints. Tough love. At least I get to wangle treats from all the soft-hearted neighbors. My mom Cathy wants to be sure I get enough exercise. Now that I am truly a city dog, I get to go on walks. I rarely get to run around the dog park, the way I did in Seattle. My mom says, “A tired dog is a good dog.” I think I’m a great dog. Don’t I look as though I get enough exercise?! Pumpkin’s foster mom, Karen, has two dogs. No wonder Pumpkin isn’t afraid of me! She lived with these two. She preferred the pug. Well, so would I. I like to play with the smaller dogs myself. 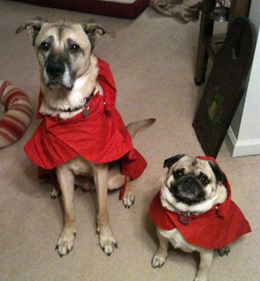 Notice that Karen has her dogs decked out for rain in these beautiful red raincoats. Don’t they look spiffy? “You don’t need a raincoat, Gracie,” my mom said. “You lived in Seattle for six years. If you can’t handle rain by now, something is wrong! My mom is tough. Fortunately she responds when I look at her intently, like I’m doing now, and beg to go out. If the power goes off, she says, we have to climb up and down five flights of stairs for EVERY walk we take. True. I’m not exactly stocking up on pills. So she’s feeling all happy and excited, which would usually mean extra walks and treats for me. But do I get anything? Right. Like I really have a choice. This is Sophie. She belongs to my Uncle Lance in Seattle so my mom says she’s my cousin. I am madly jealous. Sophie looks totally spoiled. Did you see those toys? 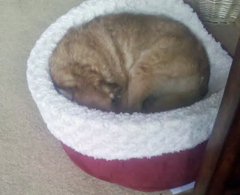 That pink bed and blue drinking bowl? 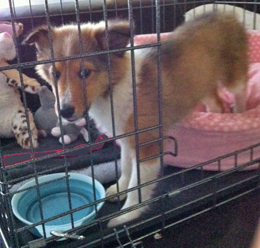 I can’t even have a bed in my crate because I’d chew it up into tiny pieces. I inherited a silver dog dish from my mom’s first dog. You can bet I won’t be getting a blue one any time soon. Sophie’s also training to be a service dog so she gets to go EVERYwhere. My mom says I’m way too stubborn to be a service dog and anyway I get tired now after a 45-minute walk. She wants Sophie to come visit Philadelphia so we can play together. I could teach Sophie a thing or two about being an urban dog and Sophie could (my mom says) teach me some manners. “Gracie, you haven’t changed a bit!” my mom says, over and over. She says I act exactly the same as I did in Seattle … except that I now like to sleep under a table instead of on the sofa. Well, there’ a reason. Our housemate Ophelia has cornered the sofa, literally. As we were coming home from the airport, my mom gave me the scoop (!) on our new life here. So now I realize I’ve flown here to be my mom’s fitness motivation coach. Great. Do I get a raise? So Ophelia is getting treated with meds. My mom force feeds her 4 times a day, gives her fluids and even adds a B-12 shot every week. Hey mom, just give me Ophelia’s food. I love cat food. Great. Now I’m my mom’s fitness coach AND I have to play social worker to a cat. If you say so, mom. Time for another nap.